I hope everyone has received information about this weekend’s activities marking the UN International Day of Peace. We’ll also be embarking on Flights for Peace on the afternoon of Sunday 22nd September at 2-3pm. We’ll ‘fly’ from Greenwich to Newham on the Emirates Air Line (cable car) in gondolas which have been reserved for us by TfL. If you’d like to join in, please let LBFN know. Young people and accompanied children will be taking part and are very welcome. We are delighted that so many organisations have offered their support: Christian Muslim Forum, Faith-based Regeneration Network, Muslim Council of Britain, Faiths Forum for London, Churches Together in England, Mosques and Imams National Advisory Board, The Cordoba Foundation and many more. It’s a very simple idea. We invite in visitors (from different traditions from our own) and exchange messages of peace. Messages from nine religious traditions are printed on each leaflet. If you would like an invitation to an Islamic centre, a synagogue (which will probably be in the sukkah) or a church, please get in touch with your local faith forum, or with LBFN, and we will arrange it. Schools are getting involved, too. You will be one of millions marking the UN International Day of Peace. Take a photograph of your event, big or small, and send it in – we like to share good news! The Facebook page for this weekend is very popular and has all the latest news, photos and updates https://www.facebook.com/sept21. The twitter name is @network_peace. This entry was posted in London, Olympic Truce, UN International Day of Peace and tagged Flights for Peace by Catriona Robertson. Bookmark the permalink. 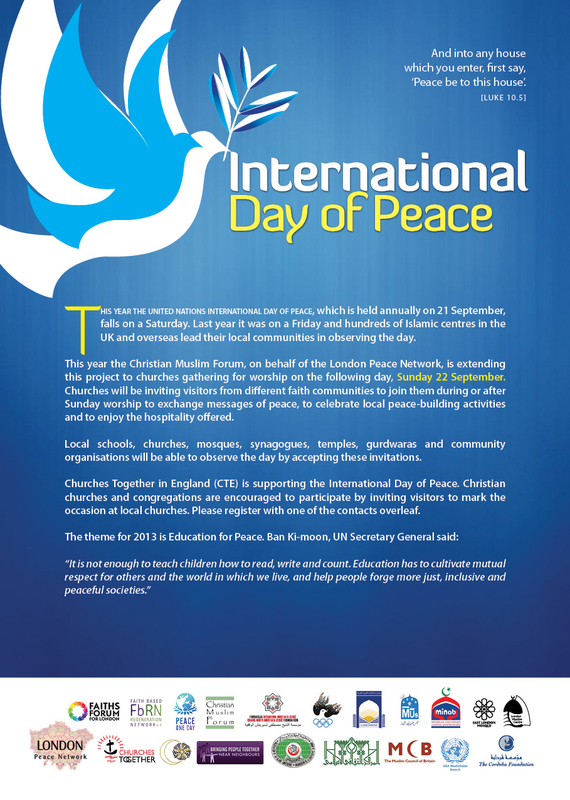 The Alif Academy, an independent Islamic Primary School in Newham (313 Katherine Road, London E7 8PJ) will be celebrating the International Day of Peace on Friday 20 September at 3.15pm, God willing. We invite people of all faiths and none to come and join us in the celebration. This is the school’s first public event this month since my appointment at the school as the new Headteacher (www.alifacademy.org). It is an opportunity to demonstrate that we are common citizens of the global village, that Islam stands for peace and an opportunity to network and work with people of different backgrounds for the common good. This sounds great – look forward to seeing you this afternoon. Thanks, Catriona. We look forward to meeting you today.